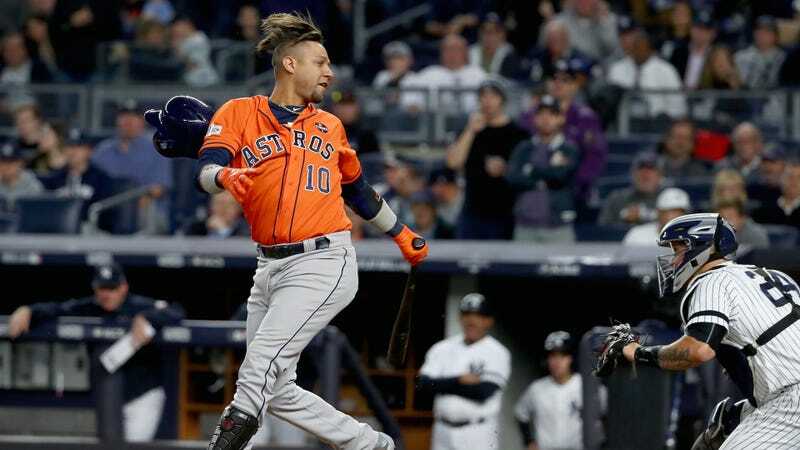 The Yankees are just one game from the World Series after tonight’s 5-0 win over the Astros—thanks to another strong starting pitching performance, sure, but also to Houston’s sudden and near-total impotence at the plate. Houston had the best regular-season offense in baseball by any number of metrics, hitting .282/.346/.478 with a lower strikeout percentage than any other team. In this series, though, they’ve been atrocious: a collective line of .153/.254/.220. (Meaning that, yeah, their OPS for the ALCS is lower than their regular-season slugging alone.) But after scoring in the first inning for every game of their divisional series against Boston, they’ve failed to do so even once here. Both of their ALCS victories have been low-offense affairs, each with a final score of 2-1 and each possible only after a near pitch-perfect performance from their starter. In the five games of this series so far, they’ve only had two innings with more than one hit. The Yankees, meanwhile, ended a smaller offensive struggle of their own tonight. After watching their DH go 2-for-33 in the first ten games of the postseason—with poor performances from Jacoby Ellsbury, Chase Headley and Matt Holliday—they finally got some action there as Headley, batting ninth, was 3-for-4 with a double. The Astros have the benefit of a Justin Verlander start on Friday to force a Game 7. But even a brilliant performance in the vein of his gem in Game 2 will need a little bit of support from the offense.